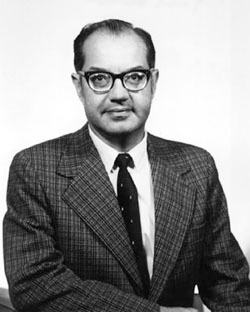 American computer engineer Paul Baran worked as a technician at Eckert-Mauchly Computer Company, on the project that developed the Universal Automatic Computer (UNIVAC), the first commercial computer. Concerned about defending American computers from a possible Soviet attack, he proposed a computer design with built-in redundancy, to mimic how the brain can sometimes recover from injuries by bypassing a damaged region. Furthering that concept, he laid out the principles of a distributed network — a centralized computer system could be rendered useless if the main hub was damaged or destroyed, but a distributed network, with myriad and varied interconnections between individual stations, could withstand attack by redirecting communications to link a network's surviving computers across different lines. In 1961 he first proposed a system now called packet sharing, wherein data would be divided into "message blocks" prior to transmission, and sent block-by-block instead of in one piece. As each block is received at any given node in the system, it is briefly stored as a computer determines the optimal route to forward it to its destination and almost instantly transmits it along. Baran said years later that the immediate response by his superiors at RAND Corporation was, "The kid's crazy. It couldn't possibly work", but packet sharing offers the advantage of maximizing the use of limited transmission routes, making a much more efficient use of bandwidth. It was the basis for the transmission system adopted a few years later as Larry Roberts laid out the structure of the Advanced Research Projects Agency Network (ARPANET), forerunner to today's internet. Packet switching was also developed independently by American engineer Leonard Kleinrock, almost concurrently, and by English engineer Donald Davies, some years later. Relocated to the United States in 1928.